Other cleaning businesses use methods such as temporary scaffolding, mechanical lifts and ladders to reach the awkward places that dust gathers. These methods can be time consuming, impractical, dangerous and inefficient. If you want someone to simplify the high level internal vacuuming process, choose Fox’s Pure Clean. 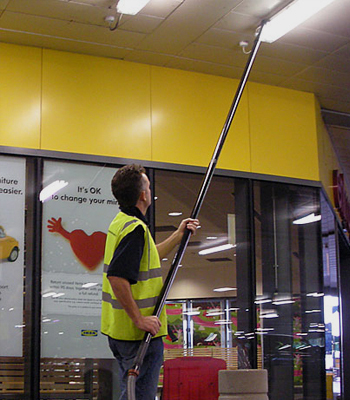 We use SkyVac internal system with carbon fibre poles. This cuts out the need for ladders, scaffolding and mechanical lifts, meaning we can clear away your accumulated dust quickly and easily.